He has visited Trump-owned golf properties on 35 days of his 165 in office so far. Donald Trump's lack of time spent in the White House has been brought into focus by a new study from NBC News. On July 3 they launched a Trump tracker which charts and documents where the President spends each of his days in office. Having been sworn in on January 19, July 3 marked Trump's 165th day as the President. NBC reports that of that period he has visited one of his many golf properties on 35 separate days. This accounts for a fifth of his time in office so far. Trump regularly frequents a number of his own courses, with 13 trips to international West Palm in Florida as well as visits to courses in Jupiter, Potomac Falls, and Bedminster. On the campaign trail in 2016 Trump regularly stated that he would be too busy to take holidays or play golf. Politifact reports that Obama had gone golfing once at the same point in his presidency. Trump is believed to have golfed at least 15 times. It is not clear how many times Trump has actually played a round of golf on his 35 visits to his golf properties. 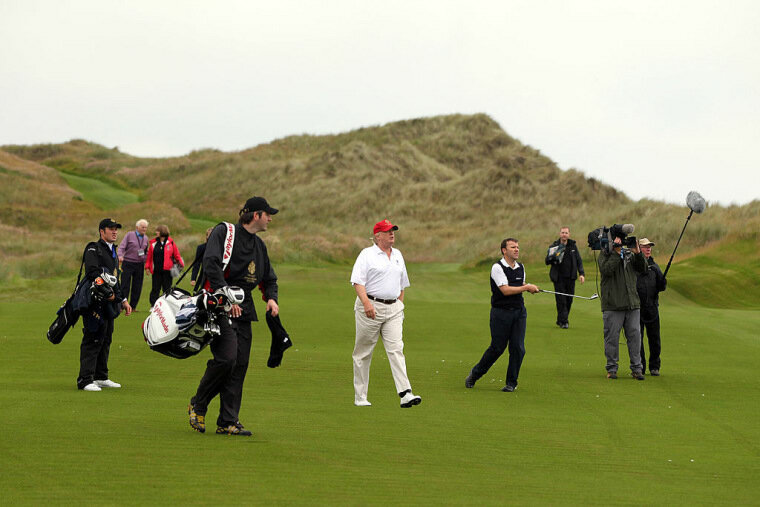 The traveling press pool are often kept away from the President with officials refusing to confirm is he has or hasn't spent time on the course. Trump is known for using his own properties for government business, causing ethics concerns among taxpayers.